You are here: Home > What Is Tungsten Carbide? Tungsten carbide is a compound of tungsten and carbon, renowned in industry for its superior durability and high melting point (2,870◦C). It is widely used in applications that require superior wear or impact resistance, such as abrasives, cutters, dies and punches. By itself, tungsten is a dense light grey metal with a melting point of 3,422◦C and very high resistance to corrosion. Its hardness is similar to that of hardened steel or emerald (7.5 on the Mohs Scale), ie, soft enough to be cut with a hacksaw. It’s also fairly ductile and can be extruded into wire; most incandescent lightbulbs therefore use tungsten as a filament. It is also used for specialist welding applications and in medical equipment. When alloyed with carbon, the hardness of tungsten increases to 9.0 on the Mohs Scale, which is just below that of diamond. This scratch-resistance is useful for creating wear-resistant components, such as saw tips or drill tips, equipment used in brick and roof tile manufacture, or for crushing machinery. Its durability also makes it an ideal choice for components needed in the hostile undersea environment encountered by the oil and gas industry. Tungsten carbide has the chemical symbol WC, though in industry it may be referred to simply as carbide (although this name is also given to other similar compounds, especially titanium carbide and tantalum carbide). In its natural state, it is a fine grey powder, which can either be sintered (compacted using heat or pressure) onto a surface, or cemented (bound with a metal to form a solid). 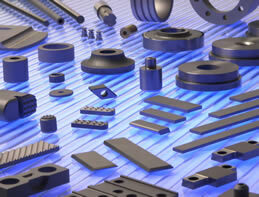 Tungsten carbide comes in grades, depending on which binders have been used – these are commonly cobalt or nickel. Other carbides may be added in order to boost specific properties, especially with regards to density, hardness or transverse rupture strength.